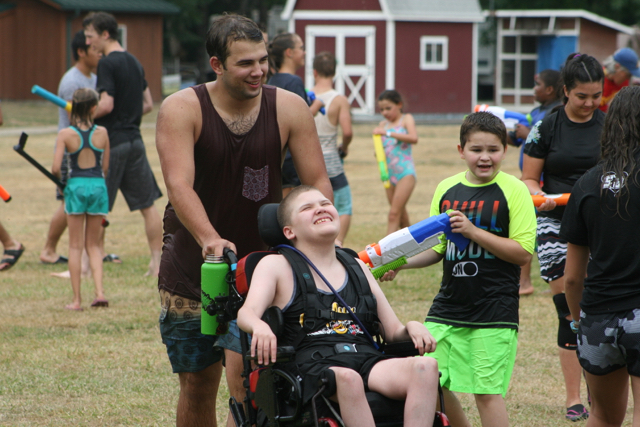 All of our Summer Staff is voluntary and raise their own support for this mission outreach to the special needs campers and their families- for whom the camp is entirely free. Sponsorships sent directly for campers are applied to cover the costs of the campers and not the staff. The support raised by staff members covers all their own food, housing, activities, and a camp T-shirt. Funds purposed to support a specific staff member can be earmarked in their name when sent by check or Paypal through the camp website. Medical Staff – 1 week or more if available. Doctor or Registered Nurse who can volunteer their time to oversee our med-station for the week as support to families for children with disabilities. Our program is overseen by an amazing ER nurse and terrific local doctor that have volunteer their time. Please contact registration@campattitude.com or call 541-401-1052 for clarification of specific responsibilities. Worship Leaders, Inspirational Speakers, or Performance Groups – per availability to come minister. Horses – The camp has a volunteer family that has run our adaptive horse program since it has began. We currently have a corral, a wheelchair ramp for loading riders, adaptive saddles and tack, an area to ride, and many handicap accessible paved woodland trails. We are always in need of upgrades to the equipment and facilities for this wonderful program so if you have an interest or would like to volunteer some time, please contact us. Show and Tell – Individuals or Groups, with fun activities for the campers, who are willing to schedule a visit. We are always looking for new activities for the families/kids. If you have something to share please do not hesitate to contact us!(I.E. Clown, Magician, Dog Trainer, Face Painter, Train Town, Square Dancers, Car Show, or a Performance Team).